With winter quickly approaching and the holidays just around the corner, many people are getting ready to enjoy the cozy warmth of the indoors with the company of friends and family. For those looking to embrace the cold, here are a handful of snowy escapes to consider this winter. With a perfect mix of adventure and relaxation, Fairbanks, Alaska is perfect for a one of a kind winter escape. Fairbanks is home to a number of adventure tours that include activities such as wildlife viewing and dog mushing. Searching for a more relaxing getaway? A night or evening visit to the local hot springs to observe the northern lights may be more your style. Fairbanks is also home to an ice museum, which was constructed from more than 1,000 tons of ice and snow. It features a gallery of ice sculptures and an infamous ice bar, a sight not to be missed. 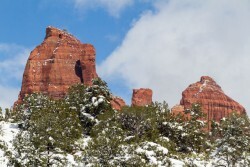 Sedona, Arizona offers travelers the unique opportunity to see a picturesque desert location with a winter overlay. With mild winter temperatures and just the right amount of snow, Sedona is a quiet getaway that is light with crowds and heavy on the luster of nature. From scenic canyon drives, hiking, or sunrise hot air balloon rides, Sedona has a little something for everyone. It also boasts some of the best stargazing skies in the region. Nestled along the California-Nevada border, Lake Tahoe is a winter destination favorite. With scenic views and plenty of recreation, Tahoe is the perfect getaway for anyone looking for a bit more adventure. A top spot for skiing and snowboarding, the area is home to a number of world-class ski resorts paired with high-end shopping and dining. If you’re looking to save on your trip, experts suggest visiting during the week or taking advantage of package deals that offer recreation and lodging. If glitz and glam isn’t your style you can save even more by staying and playing in South Lake Tahoe, which has more budget friendly hotels, restaurants, and recreation. This winter wonderland provides something for everyone. For those looking to stay warm with a rush of adrenaline, Bethel is a popular location for alpine skiing. Bethel’s ski resorts offer miles of cross-country skiing and snowmobile trails for all skill levels. Bethel also offers the unique experience of winter zip line tours and snowshoeing in the White Mountain National Forest. For the less adventurous, look into area sleigh rides or local shopping and dining opportunities. The U.S. is home to numerous snow-covered destinations. So even if one of these choices doesn’t pique your interest, there is bound to be a winter getaway that’s just right for you. So grab your coat and gloves, and enjoy your snowy escape!